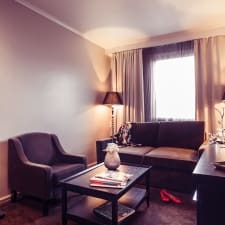 Centrally situated in Rovaniemi and right next to the Sampokeskus Shopping Centre, Arctic City Hotel boasts two meeting rooms with high-end equipment. The Lappia House is just a 15-minute walk from this four-star hotel. All rooms are modern and newly refurbished. Each is equipped with a kettle, minibar, and flat screen television. In addition, the lux rooms feature bathrooms with glass walls and full-sized tubs, while the junior suites have private saunas. Arctic City Hotel features two saunas found on the top floor, and a lounge area with fireplace where guests can relax. Furthermore, private parking and wireless Internet access are complimentary. Monte Rosa Restaurant offers Lappish and international cuisine. The 303 Lounge Bar serves coffee and wine, while the Bull Bar offers grilled dishes and cold drinks. The Arktikum is just a ten-minute walk from the hotel. The University of Lapland can be reached within a five-minute drive. Experience the best Rovaniemi has to offer! Many guests expressed that the hotel has a walking distance to a river with excellent walking trails, train station, supermarket, concert venue, and the main square. In addition, City Hotel Rovaniemi gives guests easy access to the airport, and the famous Santa Park & Village which is best enjoyed during Christmas. The guests are highly satisfied with the food because the flavours are heavenly and the presentation is creative. The breakfast buffet has a wide range of well-cooked choices. If you are a vegetarian, a bar downstairs will meet your dietary requirements. City Hotel Rovaniemi's bathrooms are extremely clean, free of foul smells, and feature heated floors which come in handy during winter according to guests. In addition, you will be delighted by the fresh and fluffy towels provided every other day. According to many guests, the walls are thin so they can hear the sound of TV's and plumbing, doors closing and opening, and footsteps. There is no need to panic though, since earplugs are provided in the rooms. The free Wi-Fi barely exists inside the rooms, so many guests noted that they have to use their gadgets at the hallways. However, you can use the desk computers with reliable Internet access at the reception area. Many guests are a bit disappointed because the sauna closes at around nine in the evening. Thus, you are encouraged to use it early to get the best out of this relaxing hotel amenity.